The container just lifts off from the base with an easy screw-off opening to fill with water under your sink. Screw the cover back on, put the container on the base, and add the top with the green movable spout. Turn it any direction you want the water vapor mist to go. It also turns colors, if you’d like to use it like a night light. Leave it off or turn it to blue or red. Of course my kids love that! And you can lock the screen so your kiddos can’t change the settings. Digital fun makes my life easy: time, humidity, temperature, water level, and mist level. You can see below that Rebecca’s room had pretty low humidity (30%) when I started using Babymoov’s digital humidifier. I set the desired level at 50% (it goes from 30-90%) and the mist level in the middle (those 3 bars—adjust with the “plus” and “minus” buttons on the bottom). What happens when the water level gets too low? It automatically turns off the mist, an icon is shown on the LCD screen, and the red light flashes. 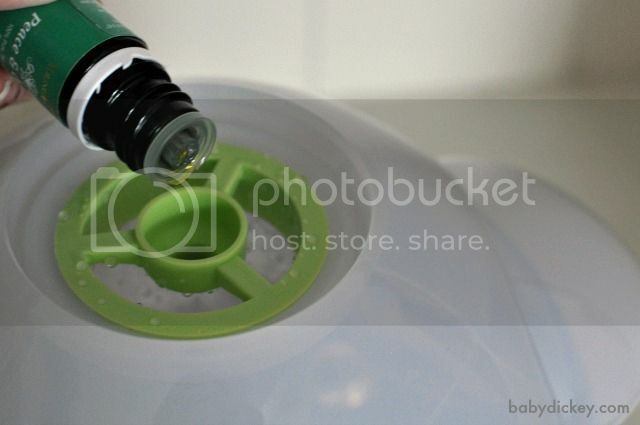 In the cover, underneath that movable green spout, there’s a little tray just for your oils. Put your drops in there, put the spout back on, and you’re all set! It is WONDERFUL. Better than my essential oil specific diffuser. Peace & Calming is one of my favorites to use for the kids… gets them nice and relaxed for nap or bedtime 😉 That or lavender and the room smells so good! Oregano, RC, or Raven if we’re sick, Lemon and Joy are uplifting, and that En-R-Gee one is for this mama! You can read more about this digital humidifier and diffuser on Babymoov’s website. Want one? Check this list of local stores near you or shop online at Amazon where it’s $99.99. 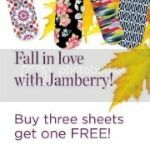 You can also find Babymoov on Facebook, Twitter, and Pinterest. ~I received product to facilitate this review. I was not compensated and any opinions are my own. 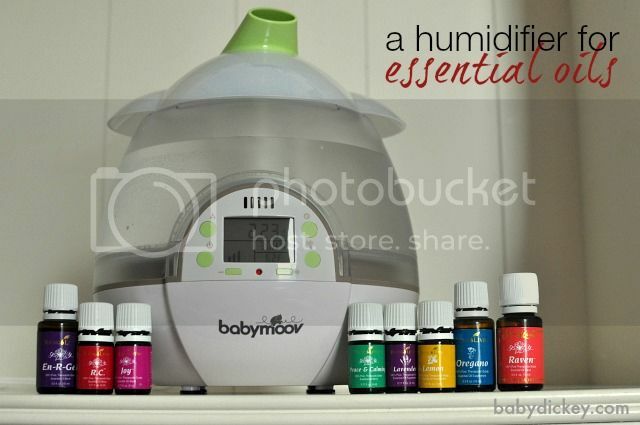 8 comments to A nursery room humidifier for your essential oils! This looks really cool. I love the lights in it too! how cool is this! i really need to try essential oils. heard so many good things. this looks awesome! I need one of these! What a great idea. I like that it can be a nightlight as well. We have limited plugs in our rooms so this kills two birds with one stone so to speak. We used a humidifier for my boys when they were younger. Wow have they really changed since then! Kelly here from New Chapter, a vitamin and supplement company from Vermont. 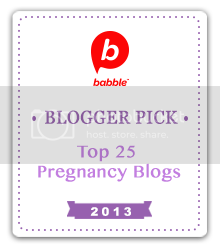 We are seeking bloggers to join our Pure & Perfect Blogger Campaign and to review our Perfect Prenatal multivitamin. 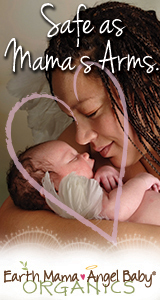 Because we love your posts, we’d be pleased to have you join our blogger outreach program to review Perfect Prenatal. If you’d be interested, please contact Kelly at kelly@saffronproject.com. Kelly on behalf of New Chapter, Inc.
My son is 18 months old – we purchased this humidifier a few months ago after two failed attempts with the other products. Love everything about it. We really needed a humidifier and I wanted one that was safe for essential oils – being able to diffuse those with the humidifier is a life saver.!! My son is 18 months old – we purchased this humidifier a few months ago after two failed attempts with the other products. Love everything about it. We really needed a humidifier and I wanted one that was safe for essential oils – being able to diffuse those with the humidifier is a life saver ! !